No matter what we write, we can learn a lot from poets. Knowing how to make the most out of every word, how to find rhythm in language, and how to convey a point with subtlety and poignancy is a talent we should all aspire to. 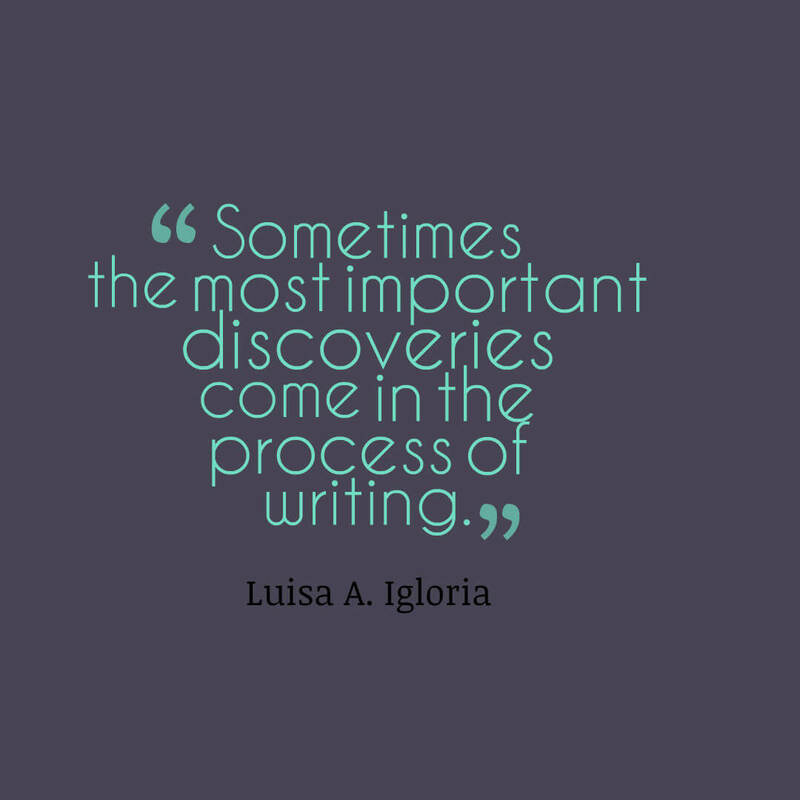 The following interview with poet Luisa A. Igloria is full of valuable takeaways and gives a glimpse into the writing life of a gifted teacher and writer. Luisa A. Igloria is the winner of the 2015 Resurgence Prize (UK), the world’s first major award for ecopoetry, selected by former UK poet laureate Sir Andrew Motion, Alice Oswald, and Jo Shapcott. She is the author of the chapbooks Haori (Tea & Tattered Pages Press, 2017), Check & Balance (Moria Press/Locofo Chaps, 2017), and Bright as Mirrors Left in the Grass (Kudzu House Press eChapbook selection for Spring 2015); plus the full length works Ode to the Heart Smaller than a Pencil Eraser (selected by Mark Doty for the 2014 May Swenson Prize, Utah State University Press), Night Willow (Phoenicia Publishing, Montreal, 2014), The Saints of Streets (University of Santo Tomas Publishing House, 2013), Juan Luna’s Revolver (2009 Ernest Sandeen Prize, University of Notre Dame Press), and nine other books. She teaches on the faculty of the MFA Creative Writing Program at Old Dominion University, which she directed from 2009-2015. 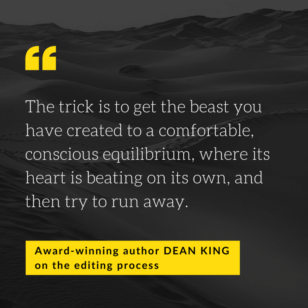 Kris: Do you edit as you write, or do you save your internal editor for a later stage? Luisa: Because I’ve built up a daily writing practice (writing at least one poem a day for the last six years plus some (as of today, 2413 days or 6 years, 7 months and 9 days), I have learned to revise as I write. For my daily writing practice, my process is primarily structured around the idea that every day, for anywhere between a half hour to an hour per day, I will come to my writing. 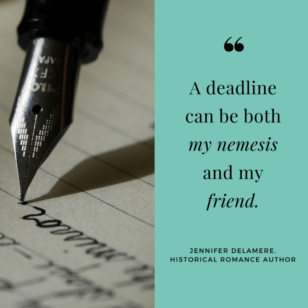 I don’t set a particular time of day—because I’m a full time academic, a mom, a spouse, and have many responsibilities on any given day, I have learned to look for those pockets of time which can then be widened just a bit so I can drop down and come to my writing there. That can be anywhere as well—in between classes, waiting at the dentist’s, waiting for my daughter to come out of school, waiting for the rice or a roast to cook before dinner; or late at night, after I’ve done my class preparations or grading, and am sipping one last coffee before bed. 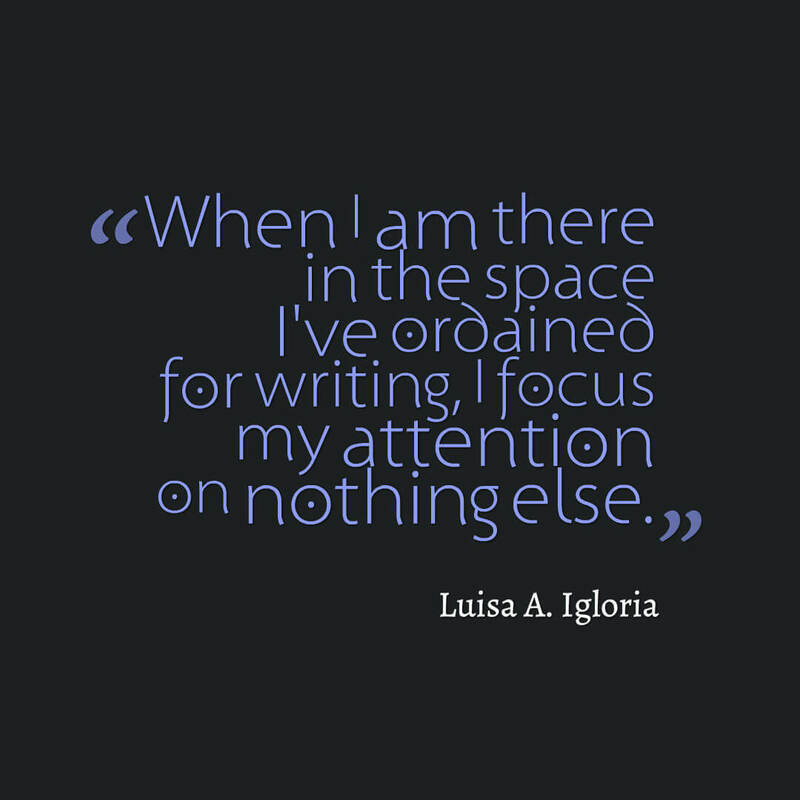 When I am there in the space I’ve ordained for writing, I focus my attention on nothing else. I look forward to this and cannot imagine not writing every day now. As I write, I review and revise fairly quickly. I often read lines aloud to myself. I listen for the sound of things. But no matter how close the writing and revision parts of my process are, I think the most important thing to do is to keep myself open and limber. In the writing/generative process, keeping open allows the poem’s energies to find themselves (subject, logic, development, feeling, tone). In the revision process, keeping open allows what we’ve learned about editorial/managerial processes over language and form to work in the service of the poem and not against it. Kris: Sometimes finding the right word can be so hard. What is your advice for other writers struggling to elevate their language and find the absolute perfect fit? Luisa: I love dictionaries. I like just flipping through dictionary pages and allowing words to just simply catch my attention. Thesauri also work in the same way for me. But the contexts surrounding words really define how we use them, and therefore our selection of them for our purposes. So then if the dictionary/thesaurus exercise doesn’t work, what usually rescues me is memory. In particular, if I try to think of the textures (not just the 5 senses, but some other more specific physical or material sensations associated with them) that attach to a memory, usually this is more helpful for better finding the right word I want to describe something. Kris: When editing for rhythm, how can you be sure that you have it right? Kris: A powerful poem evokes emotions and themes rather than explicitly stating a point, which is something I’ve found newer poets sometimes struggle with. How are you sure that you’re never preaching? Luisa: When it comes to this, I’ve found that understatement and “less is more” are important reminders. 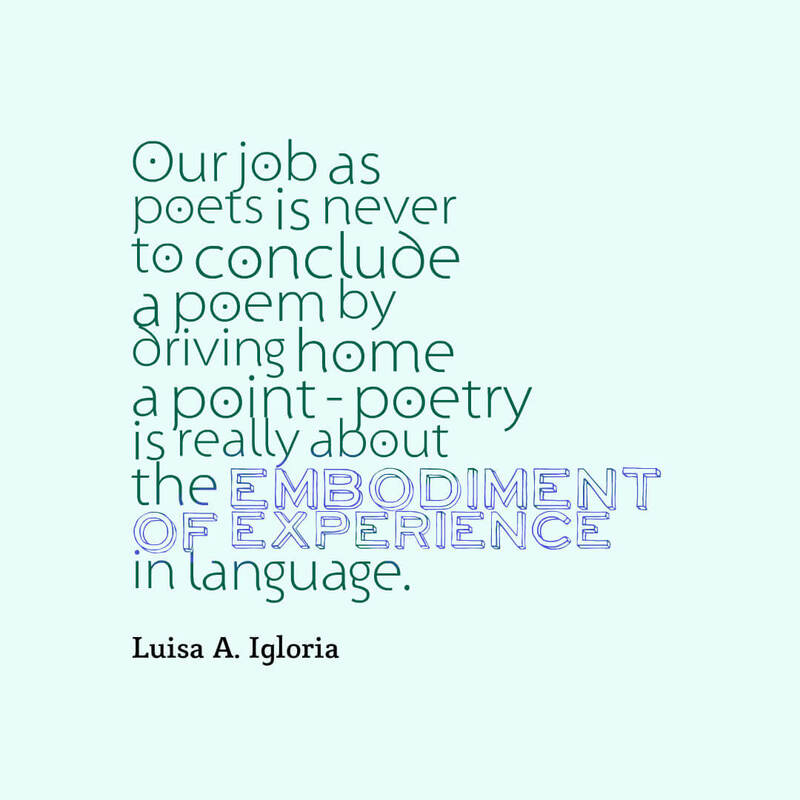 Also, remembering that our job as poets is never to “conclude” a poem by “driving home a point”—poetry is really about the embodiment of experience in language. The poets in one of my graduate workshops had a phrase for when poems or poem drafts sounded too didactic, too heavily stating a point—they said, “Oh, there’s a knowledge stone at the end of the poem.” You can almost hear when that happens: dun-dun. Letting concrete particulars do the work is so much more important—allowing images to speak for themselves. Also, I tell my students: invest in nouns and verbs and in their capacity to do the muscle work in poems—more than adjectives or adverbs. Kris: What do you wish that you knew about the editing process a long time ago? Luisa: That it’s okay to not know everything about a poem when you’re working, or even when you’re beginning; that sometimes the most important discoveries come in the process of writing. Also, that it’s okay for the poem to not resolve everything. That mystery can be such an important part of a poem’s power. A poem’s power. The power of words and language and well-composed ideas. These are the tools that can be illuminating and revolutionary, entertaining and thought-provoking and piercing. Once the words are down, they can be eye-opening, and if they aren’t, we need to remember that they are composed of (digital) ink, not immobile stone. When we take the time to finesse our language use, brilliance can arise. 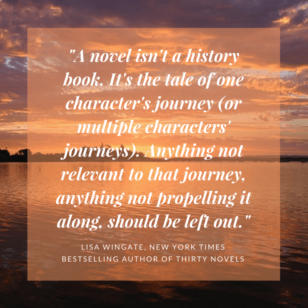 Thank you so much to Luisa A. Igloria for joining me for this interview, and happy writing, folks! Join 550+ subscribers and sign-up for my monthly email newsletter for more interviews like this.